Whether you're a blogger or a small business owner, it's always a good idea to plan ahead. 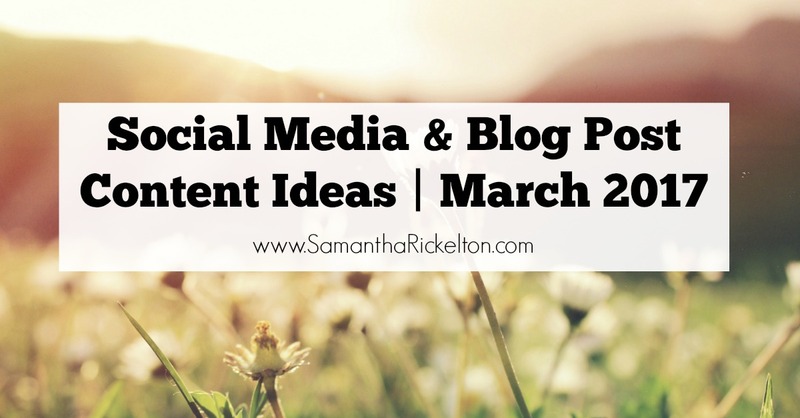 I like to plan key blog posts 6-8 weeks in advance and this list of key events in March is a fantastic base for planning your social media - you can schedule a few Facebook posts of Tweets in advance NOW and that's one less thing for you to worry about. March is a busy month and there is a lot going on. I know that my audience loves posts about food so I'll definitely be planning a post for British Pie Week with my favourite pie recipe or restaurant review. I'll also probably post a debate around school dinners on my Facebook page for International School Meals Day and something about encouraging science in our children for British Science Week. I might plan a science-themed giveaway too! For National Butcher's Week I'll make an effort to connect, mention and RT our local butchers on Twitter and on World Oral Health Day I'll make sure I re-share any blog posts I have around the subject. Same goes for National Forest Week - I'll re-share my blog posts featuring forests. Finally, for Mother's Day, I will probably plan a recipe blog post with the kids featuring something you can make - maybe Mother's Day cupcakes? and before World Book Day I'll be sharing some easy costume ideas I've found on Pinterest or you can order with next day delivery from Amazon. Let me know if you have any content ideas for March and I hope you find this list useful. For more posts like this, you can follow SamanthaRickelton.com on Facebook here. Thanks for this Sam! some great ideas for posts!